Every civilization throughout history has promulgated rules providing for the punishment of those who offend society's norms. The history of criminal justice is replete with societies that have included the practice of "incarceration" as one form of such punishment with—arguably—various degrees of success as a deterrent to crime or as a form of retribution for it. In 1996, under America's criminal justice system, we have incarcerated over 1,100,000 of our fellow citizens in federal, state and county facilities. Prison building has been described as one of the "growth" industries for the 1990s—and beyond. American society is often said to be built on "Judeo-Christian" values. Yet, the concept of prison nowhere appears in the "Judeo" part of that equation. Indeed, while sentencing options as diverse as financial penalties, 1 atonement offerings, 2 corporeal punishment, 3 capital punishment 4 and even death directly by the hand of G-d are found in the Torah, 5 the punishment of "incarceration" as we know it is nowhere to be found in traditional Torah-based Jewish law. Second, it will posit a Torah-based philosophical rationale as to why the Torah does not advocate prison. Finally, recognizing that we now live in a society that increasingly appears to demand longer and "tougher" sentences, it will offer suggestions consistent with the Torah rationale to propose certain programs in prison that should reduce recidivism and improve chances for rehabilitation. That is not to say that Jewish law did not condone restrictions on liberty. The Bible itself provides for servitude (involuntary, imposed by the court), as a reparative form of incarceration. Under certain circumstances, the court could order that a perpetrator of larceny or theft be "sold" for a period of time (not to exceed six years) in order to raise the funds necessary to make restitution. 17 Yet such court-imposed servitude could not degenerate into cruel slave labor. The "bondsman" was entitled by law to good nutrition, proper clothing, productive work and food and shelter for his wife and children. 18 Restitution, not punishment, was the goal. Another form of restrictive liberty-often misunderstood as "prisons" by readers of the Bible-were the "Cities of Refuge," three of which were established by Moses just prior to the Jews' entry into the Holy Land after wandering though the desert for forty years and three others established by Joshua after the Jews settled in the Land of Israel. 19 Those cities were, in effect, the earliest known form of "protective custody." 20 Persons found guilty of unpremeditated murder were given the option of moving into one of what eventually were six cities, thereby escaping the lawful revenge of the victim's surviving relatives. For the criminal, the consequential punishment of crime 26 brings penance, atonement, rehabilitation and ultimate purging. 27 After being punished, one starts with a fresh slate; Jewish law dictates that the community must accept the wrongdoer as before and he regains a place in the World to Come. 28 For the victim and society, punishment must serve goals such as restitution, deterrence, retribution and protection. Imprisonment does not serve these functions. It certainly brings no benefit (short or long term) to the victim. It appears to offer only temporary benefit to society (taking into account the high percentage of recidivism and the increasing numbers of people being sent "away"). And it obviously does no good for the inmate. On the contrary, prison inhibits and limits man's potential, destroys families and breeds bitterness, anger, insensitivity and eventual recidivism. Examining the extant forms of imprisonment in the Torah, one that most closely parallels the concept of punitive incarceration is the penal colonies established in the Cities of Refuge. We may find and develop some humane and beneficial aspects of imprisonment from the Torah's rules and regulations for this environment. Second, the sentencing court was obligated to send the inmate's teacher and mentor into these penal colonies together with the offender. 35 Addressing the most important needs of the inmate, the Torah insists that his Rabbi/teacher be placed in the prisoner's environment, too. The detriment of limiting the teacher's freedom is balanced against benefit of giving the incarcerated an opportunity for life through rehabilitation. A Torah-true life-introduced and administered by a competent teacher/Rabbi-can be the foremost force in this rehabilitative process. When imprisonment affords the opportunity for rehabilitation and restructuring of the offender's values, priorities and lifestyle, then a valid purpose can be established and realized. For serious and proper rehabilitation-called "Teshuvah" ("return") in the Jewish tradition-there are two necessary prerequisites. First, one must gain a true understanding and acceptance of one's present state of being as undesirable. Second, one must develop a firm and disciplined resolve to change and improve. 39 Both remorse for the past and resolutions for the future are required. 40 In the prison environment-where one is separated from society and sheds much of the externalities of societal pressures and facades-one may begin a realistic and objective evaluation of self and structure a pattern for improvement. The disciplining forces of Jewishness-the commandments referred to as "Mitzvot"-give a person: (1) the mechanism to create control devices for his actions, even to the extent of affecting habit; and (2) regulation in structuring balanced living patterns. 41 These benefits not only prepares a person for a personal life of righteousness and decency, but can extend outward to be an example to others of how not to act and how one can change. The guidelines of Jewish living, through the study of Torah and performance of its Mitzvot, allow the prison environment to be utilized in this positive manner. Indeed, as the Torah teaches, from the darkest moments and deepest loss can come the greatest light and ultimate gain. 42 Consequently, it is of utmost importance to make it possible for inmates in these physical confinements to transform a period of suspended death to vibrant life, thus fulfilling their purpose in the universe. 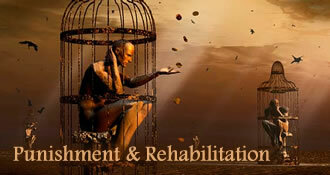 Our prison systems spend much time and money on vocational, academic and psychological programs. To really accomplish the rehabilitation that is possible in prison, we should also focus on emancipating and structuring the soul -aximizing the human potential even while temporarily incarcerating the body. The "Torah" is accepted by observant Jews as a collection of Divinely-inspired 613 commandments found in the Written Law (the five books of Moses (The Pentateuch: Genesis, Exodus, Leviticus, Numbers and Deuteronomy) and derivative precepts expounded in the Oral Law (contained in writings such as the Talmud, the Code of Jewish Law ("Shulchan Arukh") and later rabbinic rulings) (collectively, the "Mitzvot" or "Halacha"). The Torah comprises the entire code of Jewish conduct—civil law, religious law, ritual law and ethical behavior. While many rulings in Torah law are expounded by later rabbinic authorities, the lessons taught are believed to exceed even the stature of their teachers. The very first paragraph of the first chapter of the Talmud's tractate Avot states: "Moses received the Torah from Sinai and transmitted it . . ." Except for clearly-delineated original edicts imposed by rabbinical courts under exceptional circumstances — always to protect existent Torah rulings and never to contradict them — all Torah rulings and traditions are accepted to have originated no less at Sinai than did the Ten Commandments. Judaism melds ethics and morality with ritual and civil law into the total code of behavior contained in the Torah, expounded by the Sages and embodied in practice into a living expression of G-d's Will. The eternal nature of the Torah is expressed in the belief that no religious law may be abrogated, eliminated or compromised. The original 613 precepts and ancillary rules remain in force and are followed wherever possible by observant Jews even in modern times and circumstances. Talmud Pesachim 91a; Talmud Yoma 11a; Talmud Sanhedrin 81b. Maimonides, Laws of Rotze'ach ch. 4 § 8; Laws of Sanhedrin ch. 18 §§ 4-5. Tur, Choshen Mishpat 2, Tur, Choshen Mishpat 93, no. 13. Halakhot Pesukot min Ha-ge'onim No. 135, Responsa Ribash 348; Rashba, vol. 2, Responsa 276, Responsa Rosh 52:8. See Elon, Herut ha-Perat, 172, 180-225. Talmud Sanhedrin 81, 2; Maimonides, Laws of Rotze'ach ch. 4 § 8; Laws of Sanhedrin ch. 18 §§ 4-5. Exodus 21:2; Maimonides, Laws of Slaves, ch. 1. Maimonides, Laws of Slaves, ch. 9. Numbers 35, 9-34; Maimonides, Laws of the Sabbatical Year, ch. 13; Laws of Rotze'ach, ch. 8. Deuteronomy 4:42; See Likutei Sichos by Rabbi Menachem M. Schneerson, Portion of Va'eschannan, 5745. Talmud Makkoth 2:2, Encyclopedia Talmudit at 123. When Jewish law was not dominant, certain authoritative codifiers sanctioned imprisonment as a deterrent and to protect society. See, e.g., Sefer ha-Aguddah, Shabbos No. 150; Responsa Ribash No. 484; Responsa Maharash dam, Choshen Mishpat No. 390; and Rema, Choshen Mishpat 97:15. They endorsed punishments that were foreign to original Jewish law on one of two grounds. First, that Jewish law required one to "eradicate the evil from your midst" (Deuteronomy 13:6; 17:7; 19:19; 21:21), even when Torah law could not be enforced. See, e.g., Maimonides, Laws of Rotze'ach ch. 4:8-9; Laws of Sanhedrin ch. 24a). Others relied on the dictate "the law of the land is the law." Talmud Nedarim 28a; Talmud Gittin 106; Talmud Baba Kamma 113a; Talmud Baba Batra 54b. Even under these circumstances there were authorities who continued to prohibit the use of jails within Jewish communities. See Responsa Rosh No. 78:3; Responsa Rashba, vol. 1, No. 1069; Shulchan Aruch Choshen Mishpat 97:15. Talmud Shabbos 77b; Bereishis Rabba 44:1, 10:7. Talmud Berachos 60b; Likutei Torah Nasso 25c. Likutei Amarim Tanya, ch. 24. Likutei Amarim Tanya, Igeret Ha'Teshuvah, ch. 2. Likutei Amarim Tanya, ch. 36; Tanchuma Nasso 7, 1. Deuteronomy 11,13; Likutei Amarim Tanya, ch. 37. Talmud Nedarim 28a; Talmud Gittin 106; Talmud Baba Kamma 113a; Talmud Baba Batra 54b. Maimonides, Laws of Rotze'ach, ch. 6. Maimonides, Laws of Rotze'ach, ch. 7:1. Maimonides, Laws of Repentance; Likutei Amarim Tanya, Igeret Ha' Teshuvah, ch. 1. Rabah Vayikra 13:3; Rabah Bereishis 44:1. Ethics of the Fathers 6:2. Maimonides, Laws of Kings, ch. 8. Source: The following discussion is based, in great part, on public discourses given by Rabbi Menachem Mendel Schneerson, The Lubavitcher Rebbe, of blessed memory, on Purim 5736 (Spring, 1976), Shabbos Nasso and Shabbos Korach 5745 (Summer, 1985).